At its January 17th Board of Directors meeting, the Moulton Niguel Water District Board unanimously elected Brian Probolsky to serve as President of the agency, which provides water and wastewater services to more than 170,000 customers in South Orange County. 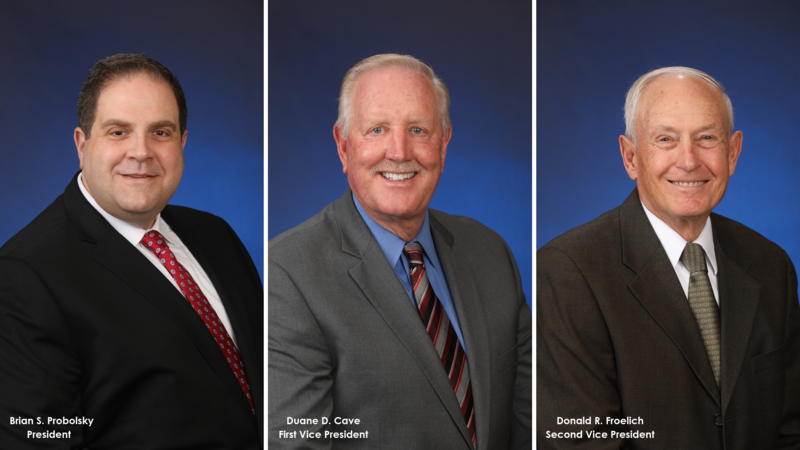 In addition, Duane Cave and Donald Froelich were elected as Vice Presidents. Probolsky, who previously served as first Vice President for the Board, said that his top priority would be to provide South Orange County homeowners and businesses with the highest-quality water service at the lowest rates. As Chair of Moulton Niguel’s finance committee, Probolsky managed its long-term financial plan and helped successfully guide the district to its AAA credit rating from two of the world’s top independent credit rating agencies. In recognition of his financial management and leadership skills, Probolsky was chosen to serve as Chair of the Orange Countywide Oversight Board, where he represents all of Orange County’s special districts. An active member of the community, Probolsky has served on the Orange County Parks Commission, South Orange County Watershed Management Area, Laguna Niguel Parks & Recreation Commission, and Saddleback College Foundation Board of Governors. Probolsky takes over the top spot at Moulton Niguel after serving for four years as a Vice President under Donald Froelich, whose tenure included balanced budgets and a reinvestment of ratepayer funds back into the District’s infrastructure. Although he ends his term as President, Froelich will continue to serve on the Board of Directors as its second Vice President. Probolsky congratulated the new Vice Presidents and praised outgoing President Froelich for his record of accomplishments and fiscal leadership. “With more than three decades of experience in the water industry, Don has guided our District on a prudent and responsible course, and we will continue to benefit from Don’s knowledge and expertise,” Probolsky said. Over the past year, Moulton Niguel has received numerous local, state and national awards for its outstanding customer service and environmental stewardship. In December, the District received the State of California’s highest environmental and economic honor for its work to protect local creeks, watersheds, and beaches from pollution. Last summer, Moulton Niguel was the only water district in the world recognized by Amazon at its annual competition for best practices in cloud innovation.